Two Thousand Fifteen will be remembered as the year 81-year old jazz and country bop guitarist Bob Wood became a modern media rock star after the second of two performance videos (the first featuring Bob careening through "Besame Mucho" at a Nashville music store) spread across the web or as he describes it, "went viral on me." And it looks like the momentum is still building, which has helped to keep the former studio guitarist, Wheeling Jamboree member, and music store owner busy at concerts and festivals throughout the U.S. We've been especially thrilled that Bob has been performing exclusively with his favorite guitar, a 1968 Epiphone Riviera, which he brought to Epiphone's headquarters in Nashville on his first visit to the showroom just before Christmas accompanied by his wife Cookie. "I'll tell you what son, if I drive 18 miles to that store on a Sunday morning you better be serious about buying a guitar. He said, 'if it sounds as good as they say it does, I'll buy it.' So I go up there and he tries it out. And he says: 'It’'s no, lie--it's pretty good. You take a trade in?' I said sure what you got. He brings in this old bass case and I'm thinking oh boy. And there it is--a perfect 1968 Epiphone Riviera. And I thought: maintain your composure Wood! Don't throw it man! So I said, well I guess we could go with it if you could throw in $150. And he jumped on it! I should be ashamed to tell it (laughs)." Bob warmed up on fiddle tunes like Old Joe Clark ("I just found he was my great grandfather--my grandmother was a Clark") and lots of pop and jazz standards including a spirited Over the Rainbow. "I mainly play on the rhythm pickup. I like the mellow tone. Out on the road I never would buy a distortion pedal. I hated them. I was a bit of a purist--I thought why pay $500 for an amp that plays clean and then spend $35 on a box to make it sound dirty? It didn't make sense to me. And then I started playing in church and bam (slaps his knee) I had to go out and buy a distortion pedal. They were playing contemporary gospel. Now I got a pedal board I bring to church. If I go play a gig I leave it setting there." In between expert renditions of guitar and fiddle standards, Bob recalled his early days as a performer. "I learned as a kid growing up in the Shenandoah Valley, Virginia where I was born and raised. My Daddy was a 5-string banjo picker and I learned to play at old fiddle hoedowns--playing things like Arkansas Traveler." His early love of jazz came with his growing sophistication on guitar. "We started learning more chords and you wanted to use them. And in country music, if you played more than three or four chords, you'd get blackballed and kicked off the stand (laughs). So I started playing jazz. I really loved the big band stuff. My real bag was the swing stuff. Howard Roberts was one of my favorite jazz players. He'd play the melody--then he'd get wild--but he'd always come back to the melody. You knew what he was playing." Bob first came to Nashville in 1969 as a rep for Microfret guitars when he got his first contract to cut a single. "I was here demonstrating those guitars in the Hermitage Hotel and I got a record contract with a little label in Memphis. I cut two of the songs and got Pick of the Week in all three trade magazines--Cashbox, Billboard, etc. I told the fellow who owned the label: they're trying to send you a message--they want to know if you're serious. We have a potential hit. It will go up a lot slower than it comes down. He told me 'well Bob, I think you're a great talent but I've become disenchanted with the music business. The fellow who produced your session took me for twenty grand.' So I go back to Virginia and cut an instrumental album--Bob Wood Plays It Cool. That got me on the Wheeling Jamboree and I stayed there 14 years. And when my record came out, I'd stand right there by the record table to sign autographs and say: 'well why you're waiting, I'll sign one of these..' Man! I'd sell them suckers like a goose eatin’ grapes." Seeing the numerous and colorful Epiphone Les Pauls on the wall, Bob expressed his admiration for the Wizard who would have been 100 in 2015. "Les Paul blew my mind--trying to figure that stuff out. He taught me to set my goals higher. But I never tried to copy anyone. It wasn't my bag." Bob does share Les' knack for surviving potential career ending disasters. "He cut the tip off of one finger and then the tip off another in his cabinet shop," said his wife Cookie while Bob was warming up with the fiery intro to "How High the Moon." "That's right," chimed Bob. "And both times it happened during the month of October. She told me you got to put a sign up in the shop--Closed in October. You cannot go in there in October again. And I haven't been in there in 10 years. When you feel that little sting, it's too late. No need looking' it's gone! The doctor told me he didn't think I'd play guitar again--this was October--and I said Doc I'll play Christmas carols. And I played Thanksgiving Carols--just cut the finger out of an old archery glove. Whatever works." Bob played in the showroom for over an hour--the very kind of impromptu jam session that Epi Stathopoulo (and Les Paul as well) wanted to be a hallmark of the House of Stathopoulo. "This is a fine guitar," said Bob of his Riviera, "It's my baby. I play it all the time." You can learn more about how Wood’s video went viral in this interview with the guitarist. From the look of things, his 15 minutes of Internet fame are far from over. The Rolling Stones have nothing on Bob Wood. Mick, Keef and the boys might be trucking into their 70s, but they’re youngins compared to 81-year-old Wood. As the video racked up views (it’s currently sitting at just over 2 million) the Internet clamored for more information about Wood, which started to trickle in, mostly via Facebook comments from Wood’s assorted family members. Wood grew up playing music in the Shenandoah Valley, and was signed on as a regular performer at Jamboree USA in Wheeling, West Virginia, in 1970, where he performed for 10 years. He was named Entertainer of the Year by Eastern States Country Music Inc., and in 2007, he was inducted into the the Southern Legends Country Music Hall of Fame. Wood cut several albums during his career, including this ice-cold piece of ’70s-era cool, Bob Wood Plays It Cool. Last week, we shared a video of 81-year-old guitarist Bob Wood shredding up a storm on an Epiphone Riviera at British Audio Service in Nashville. Wood’s performance, shot about a year ago at the Nashville music store, has been enjoying its second viral life as of late, with pretty much every online news and entertainment outlet sharing the video. Nashville NewsChannel 5 decided to sit down with their local celebrity and get the story behind the video from Wood himself. In their report, shown below, Wood explains how he happened to land himself in what has become an international news story. Thanks to the video, Wood is enjoying some much deserved fame. Prior to the video, little was known about the guitarist, who was a regular performer at Jamboree USA in Wheeling, West Virginia, in 1970, where he performed for 10 years. In 1975 and 1976, Wood was awarded Entertainer of the Year by Eastern States Country Music Inc., and in 2007 was inducted into the Southern Legends Country Music Hall of Fame. He has cut several albums, including Bob Wood Plays It Cool. Bob Wood plugged his 1968 Epiphone Riviera guitar into his amp, testing the sound. The then 80-year-old sat in British Audio Service & Music on Charlotte Avenue in Nashville one day in 2014, his right hand nimbly finger picking the strings with his pick, his left swiftly working the fretboard. His nub of a pinky finger kept up, too. And that was the day he went viral. "I said, 'What does that mean?'" the Bethpage resident said, recalling a conversation with his daughter, Mitzi. The video had 10,000 views in two days. As of Oct. 6, it's at 7.5 million. "About every month or so, somebody's got it going again," Wood said. Because of the online recognition, he has since performed at the Global Leadership Summit in Chicago, the inaugural Celebrate Aging Film Festival in Franklin, and he played before an audience of 7,000 three times during DadFest in Chicago — and got a standing ovation each time. "I guess my fingers are not supposed to work like that being 80 years old," Wood said. While Wood's talent has reached millions since — and he thanks his age for that — Wood has been known in the music industry for decades, since his first gig at 12 years old on a live radio show. 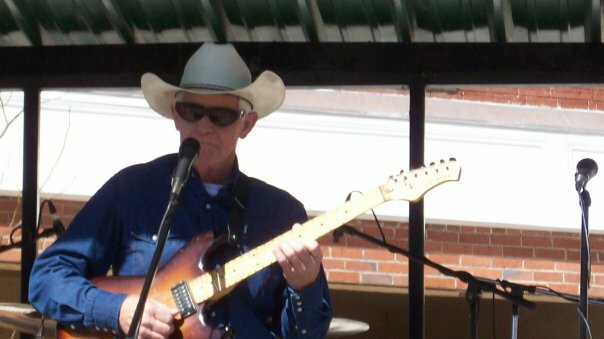 He has known and played with Carl Perkins, Lew DeWitt, Roy Clark and countless others. Even James Brown used to call him. "I couldn't understand a word he said," Wood said. "He'd start rattling off so fast and, man, he'd lose me." He has three albums in the national archives, which occurred after he presented Ovation Guitar's Bicentennial Guitar at the White House. He even played two shows with Les Paul. "For me to follow Les Paul was like following a bulldozer with a spoon," Wood said. 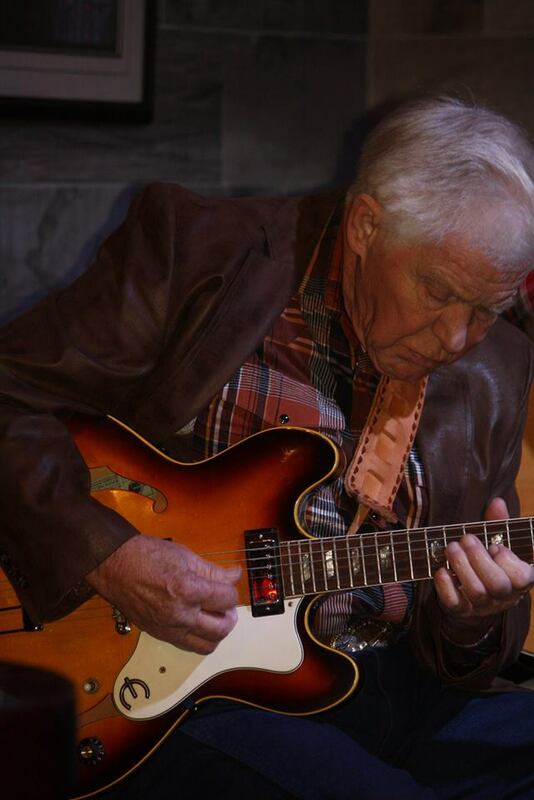 And every year since their inception, he has played Downtown Gallatin's Squarefest and Main Street Festival, just as he will Saturday with his youngest daughter, Mitzi Wood and his son-in-law, Marshall Moody. Recently, he played with "By the Way" singer Lindsay Ell on the Bobby Bones Show — but her video views didn't compare to Wood's. While doing his full-time job as a salesman for various musical equipment companies — Ampeg, Altec, Sunn, Ovation Guitars — he worked himself in the music industry and got gigs, played sessions, etc. His first boost of fame was playing Wheeling Jamboreefrom 1970-1884. A father of nine, Wood could have been a well-earning musician. Famed producer Sam Phillips invited him to be a sessions musician at Sun Records in Memphis for $100,000 the first year. But it was 1968, six months after Martin Luther King, Jr. died, in the midst of the Vietnam War, and its protests. And Memphis didn't seem like a safe city for his young children, he said. "We were kids of an almost rich and famous person," daughter Melanie Wood-Moody joked. "That's alright. We were happy." While his musician friends wanted him to move to Tennessee long before he did, he ultimately settled his family in Sumner County while employed by Altec. They moved to Hendersonville in 1974, when stores were scarce, where they lived for 21 years before moving to Bethpage. He even had a music store in White House from 1981-1986. And he's thankful for each experience he's had, as he wrote in his song, "Ain't nobody on Earth richer than me." Although he hasn't recorded songs in a decade, he assures fans he will put out new albums soon. Until then, keep watching his viral videos.